An Armful of Animals by Malcolm D, Welshman. I liked the author’s honesty of how some patients’ owner sometimes frustrated him, especially those with huge demands such as home visits. But to his credit he did go and that I’m sure it meant a lot to those who need it most. 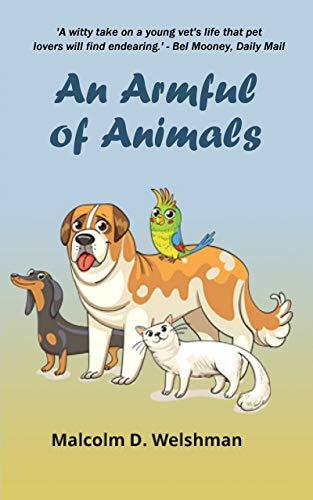 This book is funny, witty and emotional in places and perfect for any animal lover. I know I found myself giggling reading some of the chapters. The ending will bring a little tear to your eye and really does come full circle of Malcolm’s life with his beloved animals. Here’s a link to other animal books by Malcolm D, Welshman. ← My Review of Caged: The Clans of Arcadia By Arwen Chandler. I’m sure it was insightful to read his veterinary experiences. Pet owners are very protective too. Say hello to Smokey and Holly. It was a great read, you’d find it interesting I think. I will we’ll get caught up with you soon hun.